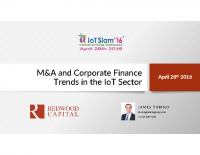 This session focuses on current consolidation and financial trends in the IoT sector, including recent mergers and acquisitions and capital formation activity. The session will also focus on valuation drivers and methodologies as impacted by growth, business model, scale, profitability and other factors. James Turino is a co-founder and Partner of Redwood Capital and a Managing Partner of LD&A Redwood. Over the past 20 years, he has advised numerous companies in the technology and communications industries on over $5 billion in mergers and acquisitions and corporate finance transactions. 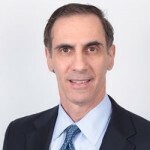 Prior to joining Redwood Capital, Mr. Turino served as Director of the Technology Investment Banking team in New York for SG Cowen, where he managed public and private equity offerings, principal investments, and mergers and acquisitions for emerging growth software companies. Mr. Turino was also Director of the Media and Telecommunications Group for Prudential Securities in New York. Previously, he held the position of Vice President, Corporate Finance for ING Barings, where he was a founding member of the Telecommunications Group. He holds an MBA from Columbia Business School and a Bachelor of Arts from Columbia College.